Aluminum Finned Motor Plate (Blue) for Slash 4x4 Discounts Apply ! 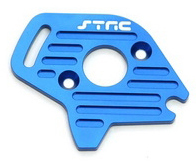 SPTST6890B - Aluminum Finned Motor Plate (Blue) for Slash 4x4. The CNC Machined Aluminum Finned Motor Plate help dissipate heat better from the motor in your Slash 4x4 and adds great factory looks to your Slash 4x4. Note: This motor plate is for the non-LCG chassis Slash 4x4. ST6890B.